It's going to be a nail-centric two weeks at Messy Wands, but I can't help it. Anything with flecks of gold is more or less guaranteed to tug at my heartstrings and there are a lot of flecks of gold out at counters right now. You can bet it hasn't been easy walking away from a lot of things. I'm still patting my own back over not succumbing to Merveille. 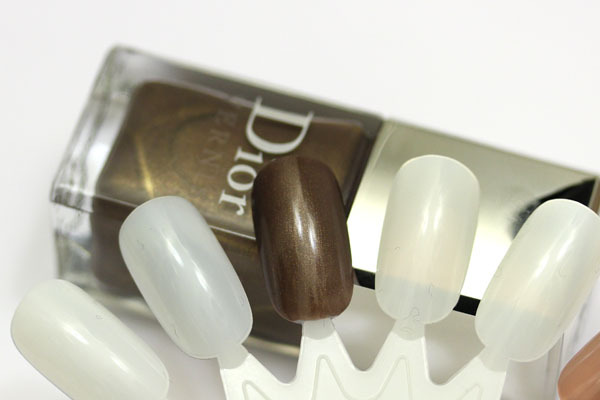 Definitely wasn't the case for Dior Vernis Exquis #611. I was so enamored by it I actually cooed while I was at the counter. 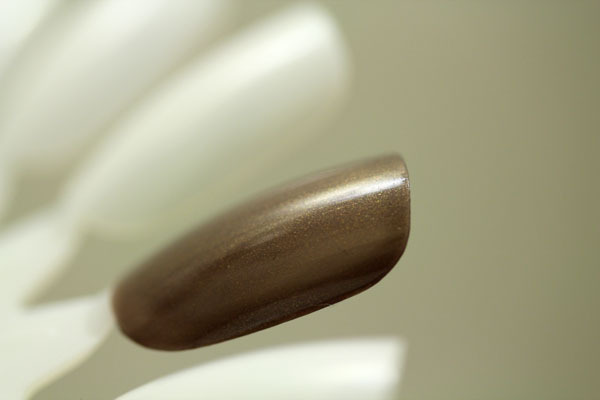 Exquis is a taupe brown with delectable gold microshimmer. I haven't had a chance to try it on my nails but I can tell it'll probably be my favorite nail polish of this season. From painting it on the nail wheel, it seems like there should be nothing to worry about in terms of texture and application. I don't have a similar color in my stash at all. 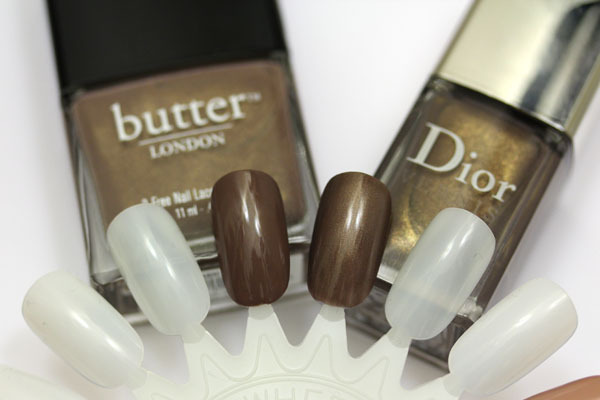 The closest was Butter London Fash Pack, but as you can see, it's not close at all. Not even. Gold flecks. Swoon. 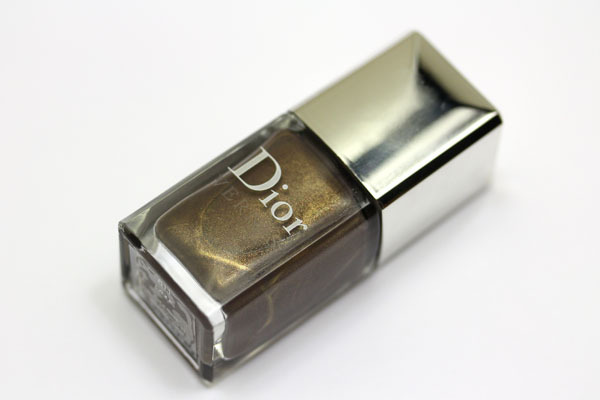 Dior Vernis Exquis #611 retails for $22 and is available at Dior counters nationwide. The rest of the Holiday 2011 Collection (except the palette! Argh!) has hit stores as well. My local Dior was sold out of the Or lipstick long before I reached it, so if you have an eye out for any of the key pieces of this collection, run to your nearest counter before it's gone. That is so beautiful, sigh. Echh . . . The first swatches I saw of this shade just looked brown, so I passed it up in favor of Apparat. Now that about every blog I read has raved about it, I may have to correct my decision. Are you planning to swatch the Or lipstick? I can't quite wrap my head around gold lipstick, so I'd love to see it on someone's face. Yep, I came home with this one, too :) I ordered Nocturne online today, after seeing Temptalia's swatch! I did manage to swatch the lipsticks in person at the store, and wanted Nocturne then, but decided overall they weren't that fab. Then Christine swatched it and I changed my mind! What a beautiful color! It's called "exquis" though (French for "exquisite"), not "exquix". I must have this! Great pics! 0 you do need to have physical access to the keylogger is password protected. sent to your e-mail inbox.